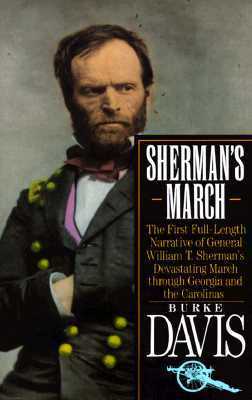 Sherman's March is the vivid narrative of General William T. Sherman's devastating sweep through Georgia and the Carolinas in the closing days of the Civil War. Weaving together hundreds of eyewitness stories, Burke Davis graphically brings to life the dramatic experiences of the 65,000 Federal troops who plundered their way through the South and those of the anguished -- and often defiant -- Confederate women and men who sought to protect themselves and their family treasures, usually in vain. Dominating these events is the general himself -- "Uncle Billy" to his troops, the devil incarnate to the Southerners he encountered. General Sherman took the battle to the heart of the Confederacy when he marched his army through Georgia to the sea, inflicting the maximum destruction on the land as he passed through. William Tecumseh Sherman fought a war of destruction in Georgia, aimed at destroying the South's will and ability to fight. Georgia was the southernmost and last of the original thirteen colonies on the Atlantic seaboard.